The Bharatiya Janata party (BJP) unit of Tripura came down heavily on the Communist Party of India –Marxist (CPI-M) on the latter’s booklet ‘Tripura Model: People Ahead of All’. The BJP has demanded ‘appropriate steps’ as per the law of the land against the writer and the publisher for alleged ‘unparliamentary text’ in the booklet. In the 40-page booklet, former CPI (M) Rajya Sabha member Brinda Karat alleged Prime Minister’s Office (PMO) was directly involved in secessionist forces triggering a storm in the political circle in the poll-bound State. Karat in the booklet published simultaneously in three languages- Bengali, English and Hindu also mentioned that the role of BJP and RSS is crime based. “If her allegation is true then Prime Minister Narendra Modi will also be crime based! 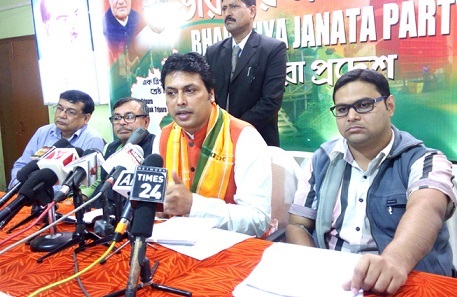 We are shocked if a former MP stoops to such a low”, said BJP state president Biplab Deb. “It is an absolutely baseless allegation levelled against PMO as there was no proof to substantiate the allegation. This kind of writing amounts to anti-national and sedition”, he added. “We have met Governor Tathagata Roy at Raj Bhavan here on Tuesday evening and apprised him about the text of the CPI (M) booklet penned by the former MP,” Deb informed. A copy of the booklet was also handed over to the Governor. “We urge the Governor, who is the constitutional head of the State to take steps against both the writer and the publisher under the framework of the Constitution. We have faith on the Governor to take up the matter seriously,” the BJP state president further said. Coming down heavily on Chief Minister Manik Sarkar, Deb also alleged Sarkar had also spoken against national interest in presence of ministers from Myanmar and Bangladesh.